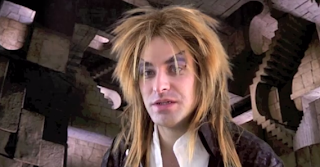 Labyrinth is a classic fantasy film, and a lot of the filming was documented in the occasional documentary. For some reason, they decided to interview David Bowie's stunt double Dave Leavis on the set. The interview was apparently not included in previous DVD releases, and it's pretty easy to see why. He criticizes everything from David Bowie's constant singing to Jim Henson's relationship with puppets. It's an interesting look behind the scenes on the set, though. UPDATE: Yeah, this isn't real. It's a parody video by YouTube comedy, Talk to Rex. Psych! Labyrinth was never my favorite, but I do have great respect for everything Jim Henson created. I don't think I ever actually finished watching that movie. I know I saw part of it on TV but it didn't hold my interest at the time. I guess that must have been back in the 80's.